I'm constantly trying to manipulate the feelings of my coworkers. 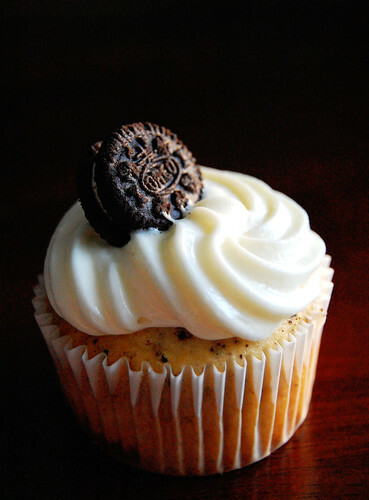 This week's persuasion was inspired by Fake Ginger's recipe for Cookies & Cream Cupcakes. Since I only had the baking powder box in the fridge soaking up deli meat aromas, I had to modify. 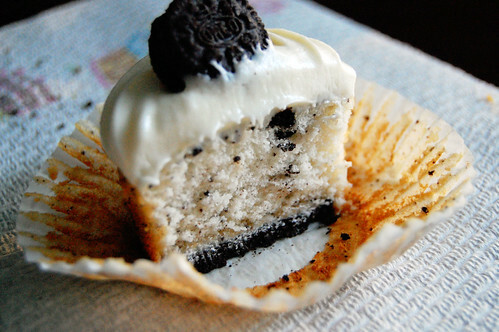 I used a white cake mix and simply stirred in the crushed Oreos. And I used a baby Oreo because it's figgin' adorable. The reviews were glowing. Especially because of that Oreo on bottom carrying the weight of my exploitation. Sweet sassy molassy, they look phenomenal. Feel free to send a dozen or 5 over here. S: Wouldn't it be nice if I could pack them up for you and your little nugget?!? Yes, those could manipulate me very easily. A: I wish we were neighbors too!!! K: There's power in the sugar.